On a lark, I went to the Google Glass Explorer Signup website. I had just had a real live demo of Google Glass at the edCamp in Green Bay. Being a total "tech geek," I really wanted to be part of the program. About 8 weeks later, I received the email you see to your left. I was able to find the finances to be part of the program and in less than 24 hours after ordering Glass...it was in my hands. I have had Google Glass for a little over 3 months now. I have shared the experience with my students, colleagues, friends, and many other people. I have also contributed to the Glass forum and as of right now (March 2014), I have an app idea that is being matched up with a developer to maybe bring to life. The journey with Glass continues...more to come later. "You are a pioneer, a founder and an architect of what's possible. 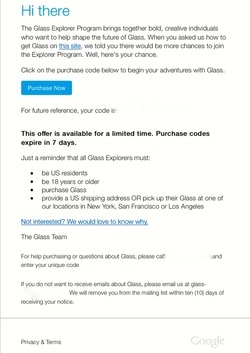 You are a Glass Explorer. We have an exciting journey ahead of us, and what happens next starts with you." 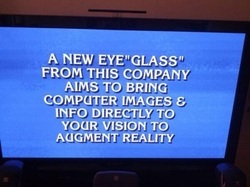 And the question is...What is "Google Glass"